Goodmorning! Today I am feeling a little blue. My poor husband is healing and has such a great attitude...but it's a long road and last night he was in such pain ... it's hard to watch. I have a prayer group that meets every Wednesday and I'm going . If any of you need some prayer just let me know. We have met for over nine years and have had so many amazing things happen. 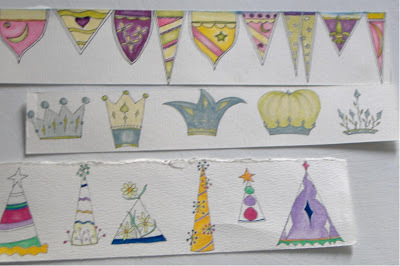 Yesterday I was playing around with some little ink series of drawings I did along time ago and started to color them in...I am working still on the "party hats".